A company’s signage is the most important determiner of how well your business will perform. It does not matter which sector of the industry you are in. A sign will inform the customers who you are and the major details about what you deal with. The signs are necessary to show the different offices or any other buildings inside the company like the restrooms. In the modern world, a business can make use of any of the various types of signs and they have a long term service hence there will be no need to keep replacing them frequently. Engraved signage is the best in the market. 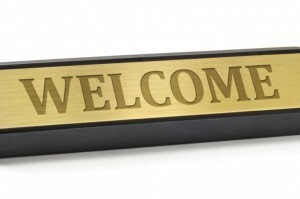 This blog will be covering some of the top advantages of engraved signage. You might have doubts about which type of business can use engraved signage, not to worry. It does not matter whether it is a big or small business. As long as the owner wants a well performing business they can get the engraving services. Apart from signage for your exterior, you can arrange for name tags, directional, warning signs, control panels and even office tags. The advantage is that you get to choose exactly what suits you well. The technology and machines used for engraving services are so advanced in a way that the product you receive sis the same as the desired look that you approved. There are rarely any mistakes when it comes to the design hence results are satisfying. The piece you get after engraving has the best outlook. It is very crisp and very clean. They are also very readable and this is because engraving uses computers so no matter how complex the design is it will always turn out great. Paint signs wear off very fast and they can be frustrating however, engraved signs can last so long even in the worst conditions like poor weather. Even chemicals cannot destroy the wording on the engraved signs. The expenditure of the manufacturer is low hence there is a possibility they will charge you an affordable price. This is because engraving does not easily wear and tear the tools that are used. The engraved signs only need wiping using some affordable products. Some are a metal polish and a rag. It is easy and saves a lot of time. There is a variety of signage materials from which a client can choose from. We can engrave bronze signs or copper, glass, wood, leather, fabric and metal engraving are some of the types of materials you can choose from. There is a very big development on the technology used to perform engraving. You should get a professional engraving company to perform this service for your company. They will give you all the necessary information you need about engraved signs.